After Mike and Bruno had left I sat in the Bongo for a while and made a coffee. I waited for a convoy of 4×4’s towing quad bikes to pass along the road, the hunt was clearly over. I did not want to come face to face with a vehicle on the narrow ribbon of tarmac whilst driving to the head of the valley. The drive up to the parking place near Chew Green was slow, given the state of the potholed road. 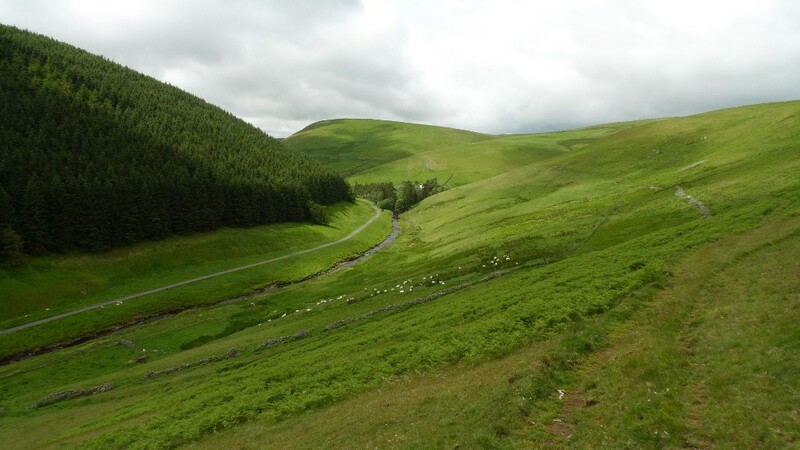 I got a real sense of getting away from it all as I progressed further up the valley. The final building was Makendon which has been taken over by the military. Near the old farmhouse was this sign. 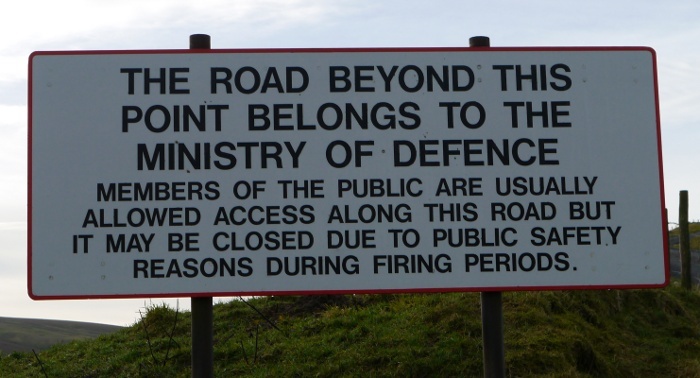 As I drove up the hill I noticed that the surface became smoothly tarmaced, the military doing a better job at maintenance than the local authority. Just before the gate that sometimes bars traffic from the firing range there is a small parking area. I spent a peaceful night there in the van, totally undisturbed by passing traffic once it had got dark. It was cosy laying in my sleeping bag listening to the wind and the rain. It was still dark when I got up. I made a coffee and wandered around the van whilst Reuben sniffed about. The weather had cleared in the night and the sky had turned a glorious shade of pink in the pre-dawn air. A few pockets of frost had formed on bits of the grass that was sheltered from the wind. After breakfast I quickly packed a bag with my camera and a few snacks and we set off up the military road. The flags would not be flying for another couple of days which meant that the gate across the road was open. It was a steep haul up the smooth tarmac, giving views back to where I had spent the night. As we got higher I could hear the sound of dreaded trail bikes, unseen they sounded like a hornets nest that had been disturbed. With the noise growing louder I could see a convoy of about a dozen riding the border ridge a couple of miles away. Riding illegally and churning up the soft ground. Bastards. 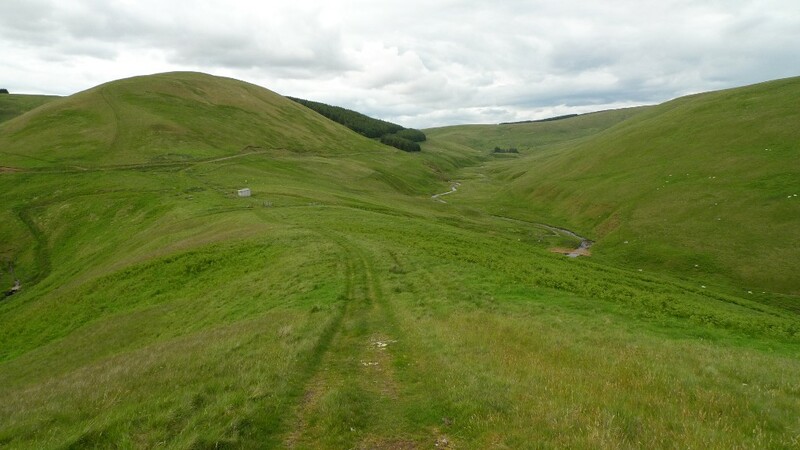 Strictly speaking you are meant to stick to the rights of way when crossing the Redesdale and Otterburn firing ranges, open only when there is no firing taking place. However there was a hill I wanted to bag. 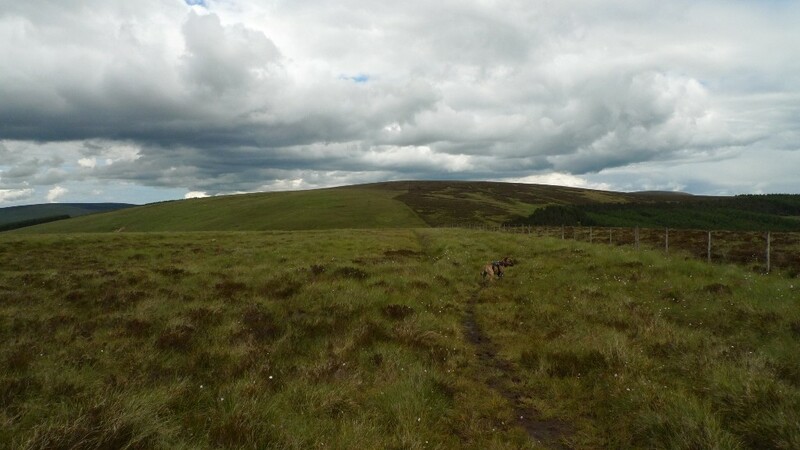 The sheep on the moor had all their limbs present so I made the assumption all was well, crossing rough ground to the summit of Thirl Moor. There are what appears to be several tumuli and a few metal posts with star symbols on them. I assume they mean there is some archeological remains. The best feature of this hill however is the view. 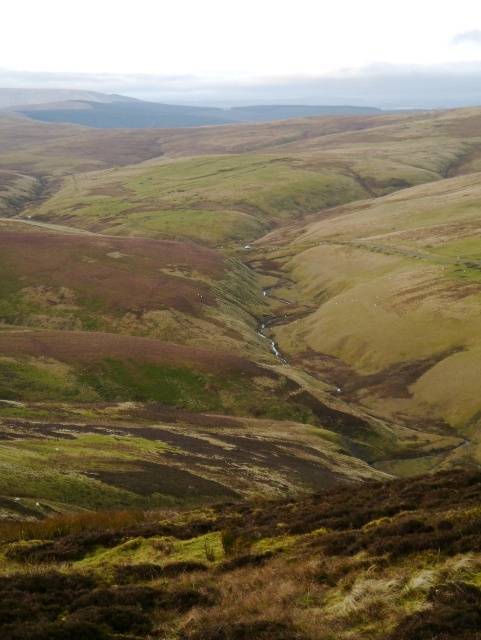 It sits in the middle of nowhere and the surrounding moors stretch unbroken to all horizons. There are no modern man-made structures to break up the landscape. 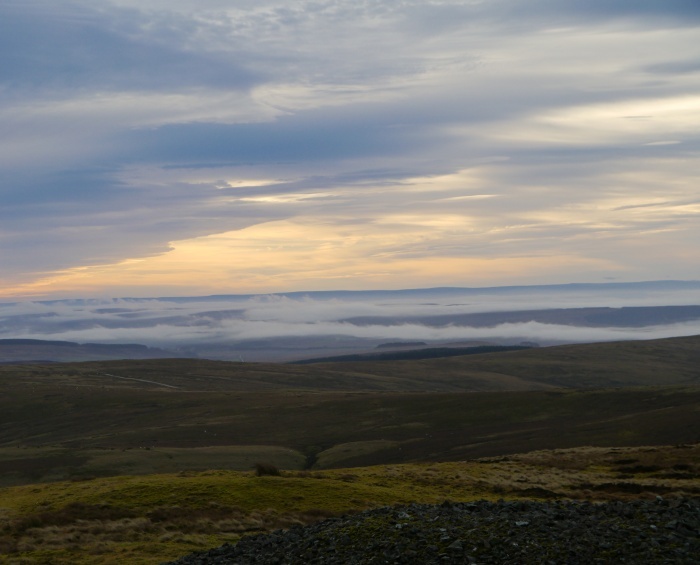 Cloud drifting above the distant Kielder forest just added to the perfectness of it all. 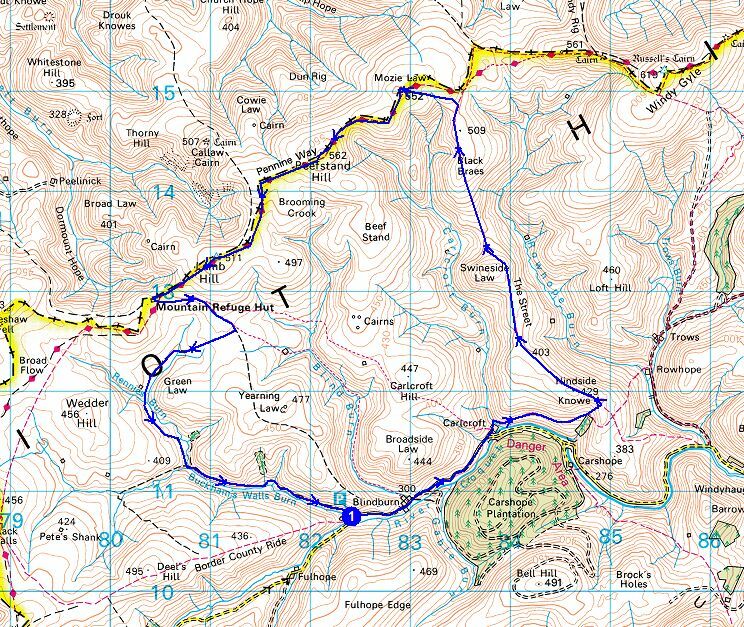 A quad bike track to the north soon petered out and we descended through deep heather before finding a contouring path. 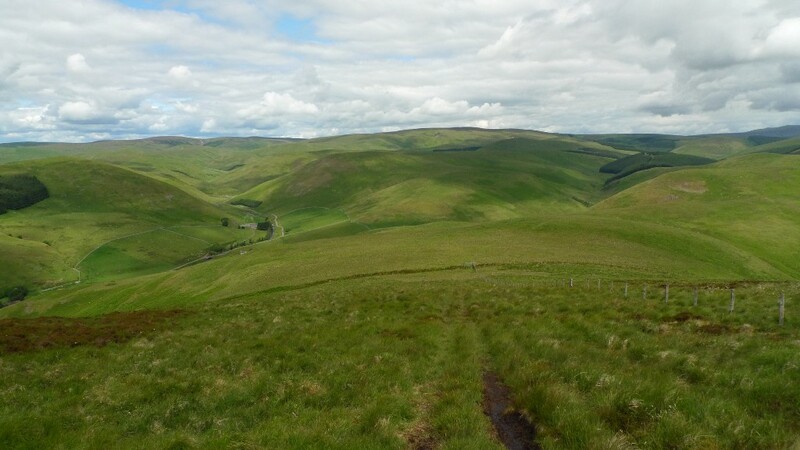 This gave a cracking view down the Upper Coquet, the van a tiny white spec in the distance. With the building of Makendon directly below us we made a steep descent through the heather which did its best to trip me up. It was slow going trying to stay upright. 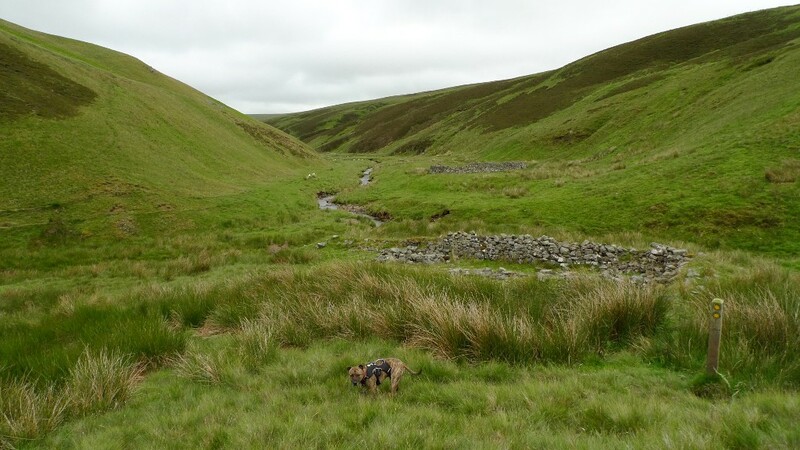 Finally we made it to the river bank, crossing at the far end of the old farm and exiting through numerous sheep pens. We timed this to perfection as a farmer came up the road at that very moment and we were not on a right of way. Thankfully he waved as he passed. A track took us up pastures on the other side of the valley where I came across evidence of trail bike riders. The bridleway was a wide boggy mess from numerous wheels, mud flung in all directions. It took a while to carefully pick my way to the summit of Brownhart Law, ducking briefly into Scotland just because I could. 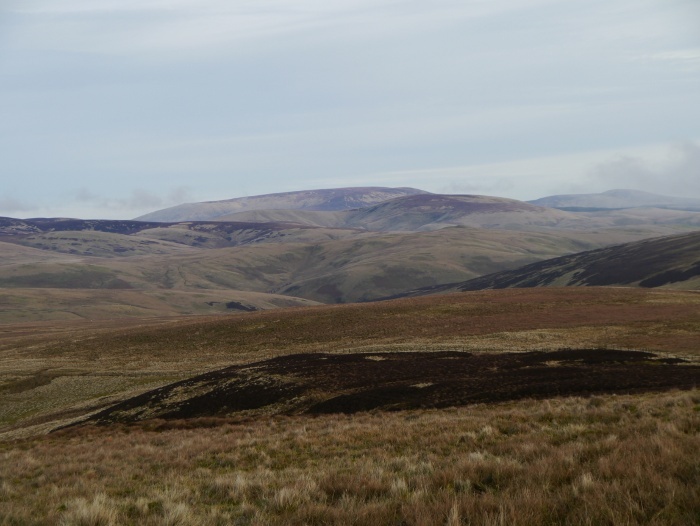 The Cheviot sat large and brooding in the distance, a long march away via the Pennine way. It was an easy yomp back to the Bongo via the Roman Camp of Chew Green, not particularly noticeable on the ground as you walk though it. You need to head across the valley and view it from there to really appreciate the scale. Back at the van I got the stove on and made lunch whilst watching the clouds begin to lower onto the hills. I sorted out my pre-packed backpacking rucksack and added a few extra bits such as a bow saw. It’s not very often that I head into the wilds with a bow saw strapped to my pack! I set back off towards Chew Green with Reuben in tow, stopping almost immediately to put on waterproof trousers as a fine drizzle set in. 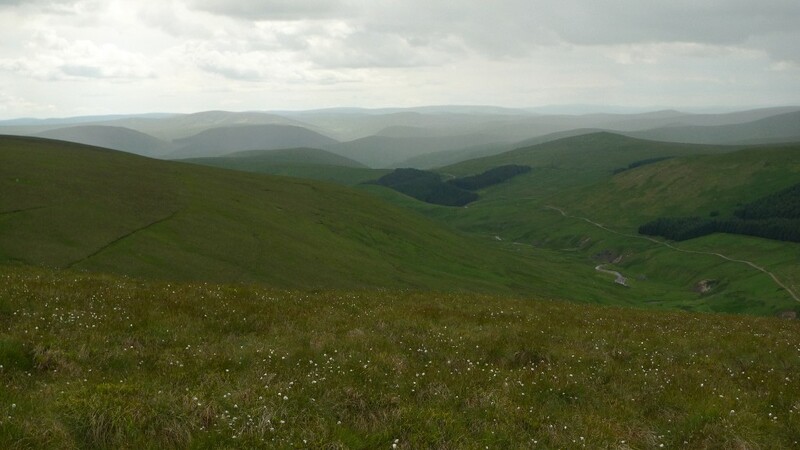 We passed a hiker out for a day walk from Byrness, we were the first signs of life he had seen all day on these remote border hills. After a chat we continued on our separate ways and I stopped after a while to watch him as he moved across the wide open and increasingly murky landscape. Watching the small speck finally disappear just seemed to enhance the sense of bleakness. 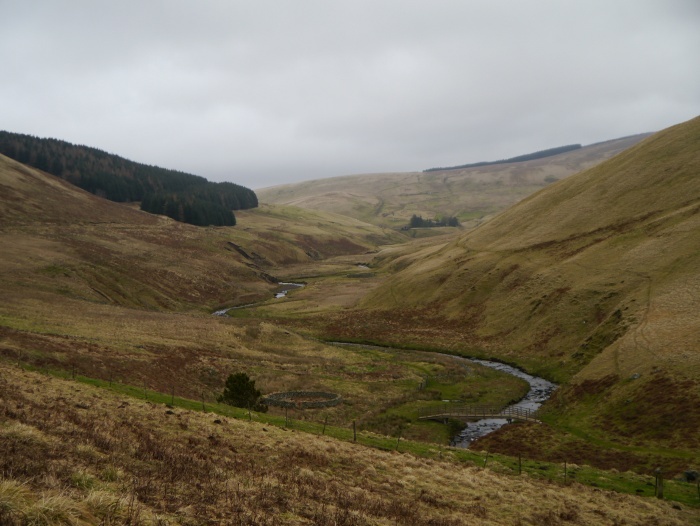 I had left the comfort and security of the van to head for a tiny bothy five kilometres away. I had stayed there a few years previous on a lovely summers weekend and had always planned to return in the winter. I was a little nervous hoping that it would be empty, four would be a crowd in the single room. I was not carrying a tent as pitching options are pretty non-existent outside. If it was occupied and no room for me and the dog it was going to be a long walk back to the van across the moor in the dark! 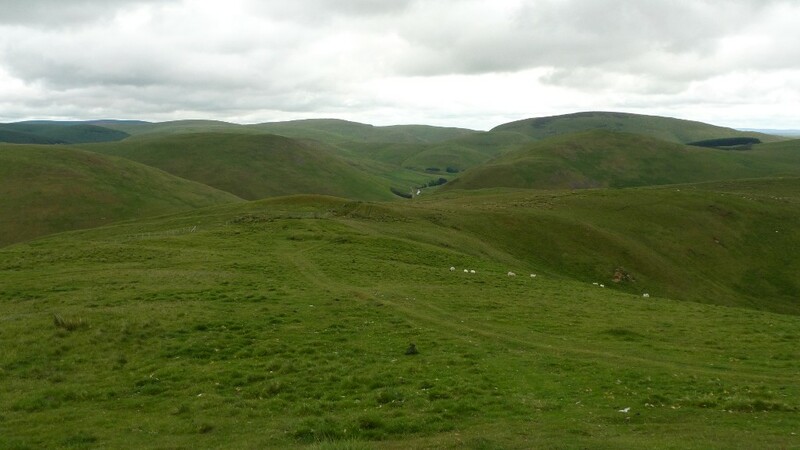 The first section of the path was fairly easy-going, following the course of the Pennine way. This was soon left for a boggy and tussocky squelch towards the bridleway at The Heart’s Toe. 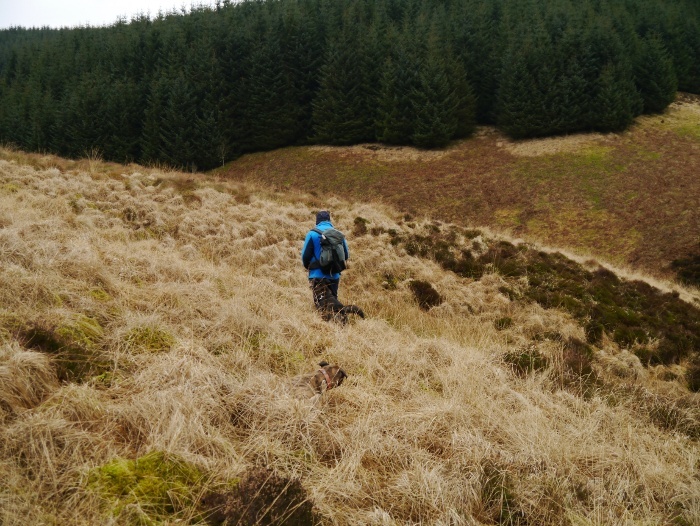 However I soon got fed up with the rough going and hopped the fence, fighting my way across a section of felled forest to a gravel forestry track. 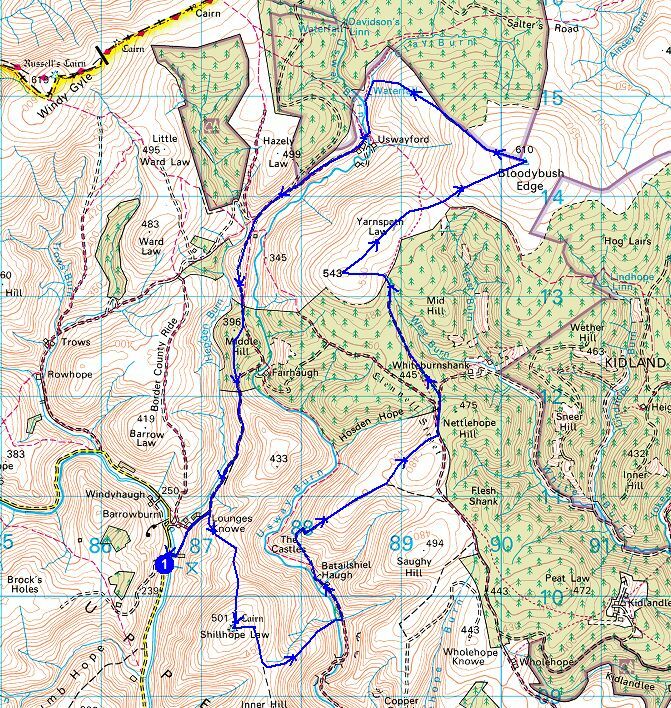 It was then an easy downhill walk all the way to the bothy. It’s amazing how often the mind plays tricks on you. Whenever I approach a bothy I get a whiff of wood smoke, whether there is smoke or not. Is it the way my brain anticipates the people who may already be in residence? The tiny building sat below me amongst a scene of devastation. Pretty much the entire forest that surrounded it has been clear felled. The last time I had visited it was secretly nestled deep in the forest. I found a recently felled small pine tree in the forest and dragged it down the steep slopes towards the bothy. I was keen to have a roaring fire that night. As I approached it was evident that no one was in residence, the door was bolted from the outside and no smoke was coming from the chimney. The carved wooden sign welcomes you in. 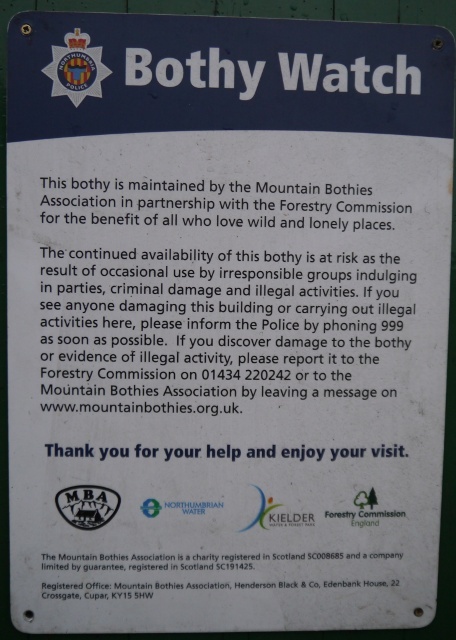 Less welcoming however is the new ‘Bothy watch’ sign. 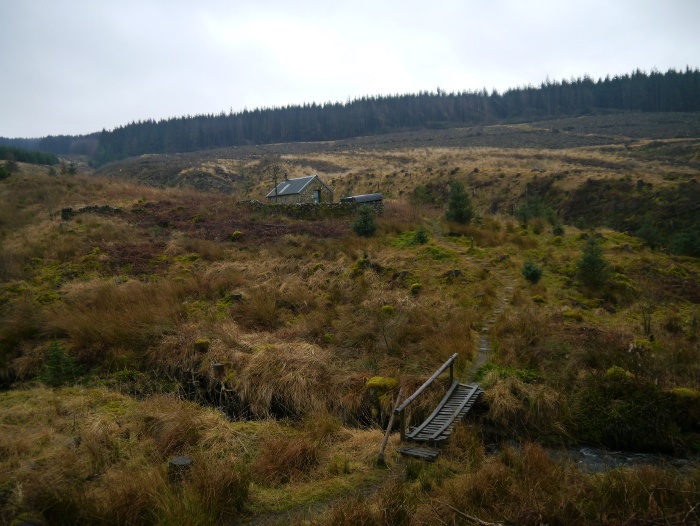 The bothies in the Kielder area have unfortunately become notorious for some of the people that they attract. 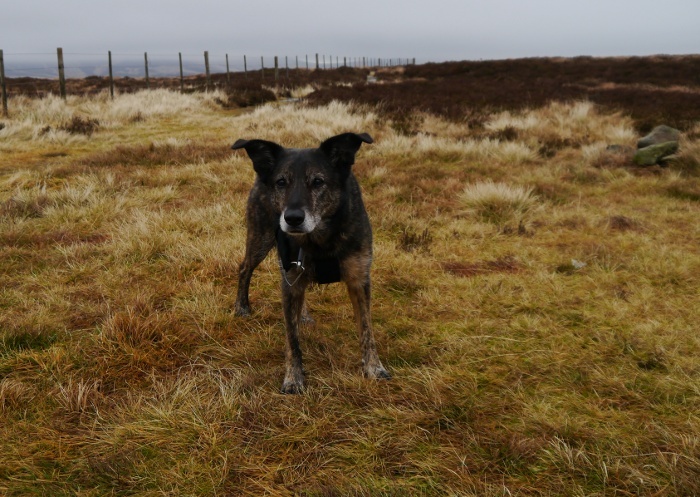 A few have been shut down recently, including the lovely one at Kielder Head. A draw for complete f***wits for a spot of mindless vandalism, parties and drug taking. 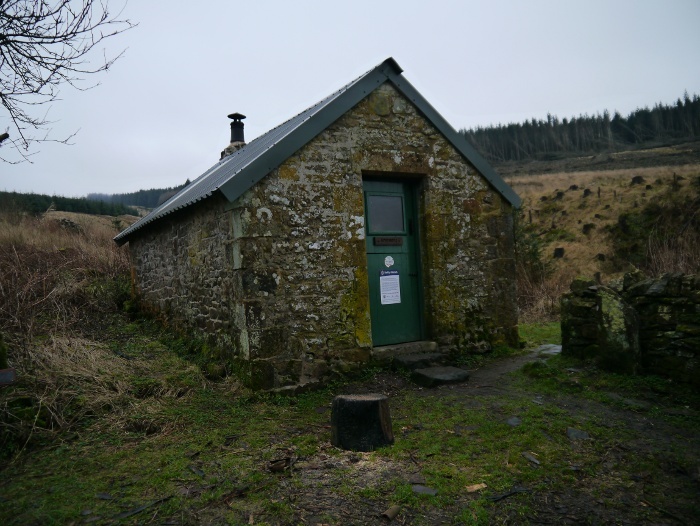 At least Bothy watch is a positive commitment to keep these shelters open rather than letting the mindless few ruin it for others. On my walk down I had been wondering ‘who’ I might end up sharing with rather than ‘if’. 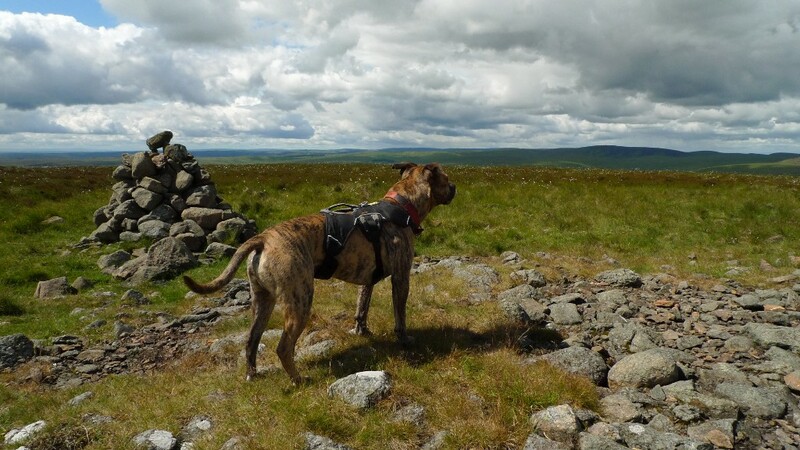 On the positive side, strangers do not know that Reuben is a completely soppy hound! The bothy as it turned out was completely spotless. There was not even a scrap of rubbish or any of the ubiquitous wine bottle / candlestick holders. The floor was swept and the stove still had warm embers from the previous occupants. Even better was the basket of bone dry logs. My earlier worries quickly faded away. I spent a pleasurable afternoon drinking coffee and sawing the tree into smaller pieces so that it would fit in the woodshed. A constant drizzle sent me inside where I lit the fire. 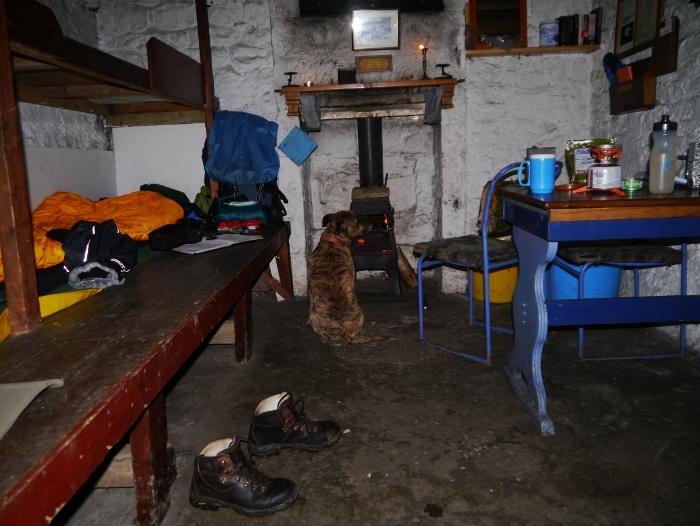 The stove was soon roaring, Reuben claiming his spot for the evening. I love bothy nights and this was one was very enjoyable. The wind and rain picked up as the evening progressed, enhancing the general feeling of coziness. The morning dawned dull and grey, however after a good and long sleep I managed to get up early. After breakfast I set about replenishing the wood that I had used the night before. Half an hour with the bow saw and there was a satisfying pile of dry logs stacked in the bothy. 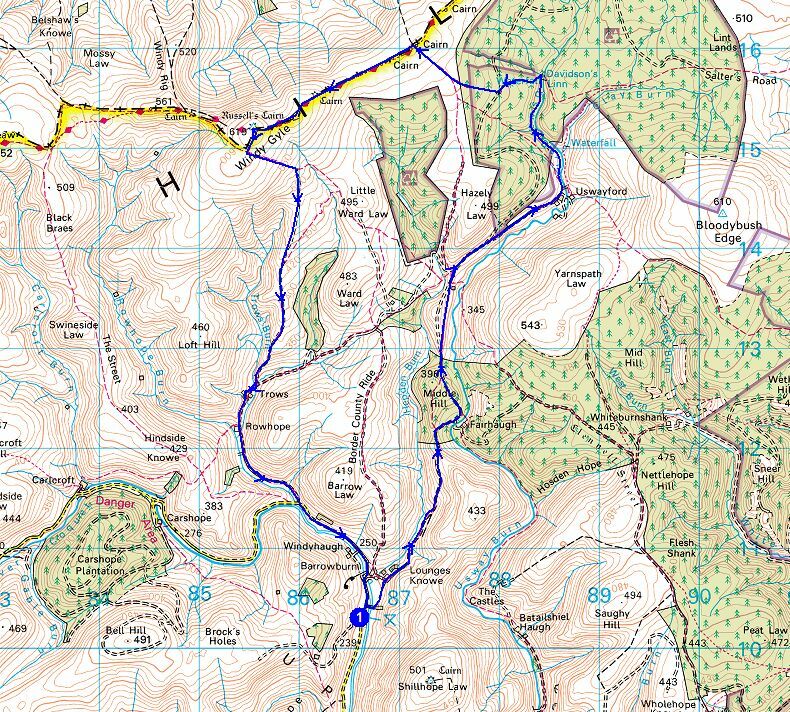 A good sweep and an idiot check to make sure I had not left anything and we set off across the bridge and up to the forestry track. The walk back to the van was a bit of a trudge in the rain, more chore than pleasure to be honest. I was pleased to see the Bongo was still where I had left it. I worry about leaving a vehicle in such a remote spot but figure it is no more risky than somewhere more populated. I suppose it’s just luck of the draw. The red flags were still not flying so I took the opportunity to drive home via the military road rather than returning back via Alwinton. 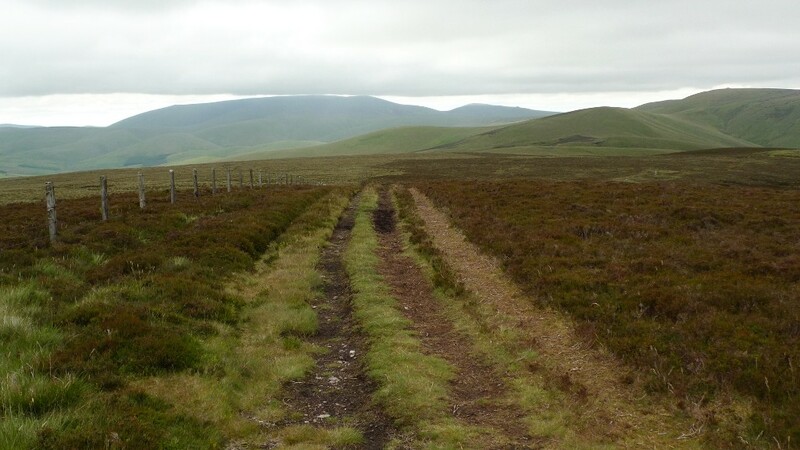 The Cottonhope road is marked as a bridleway on the map but is often open to civilian traffic. 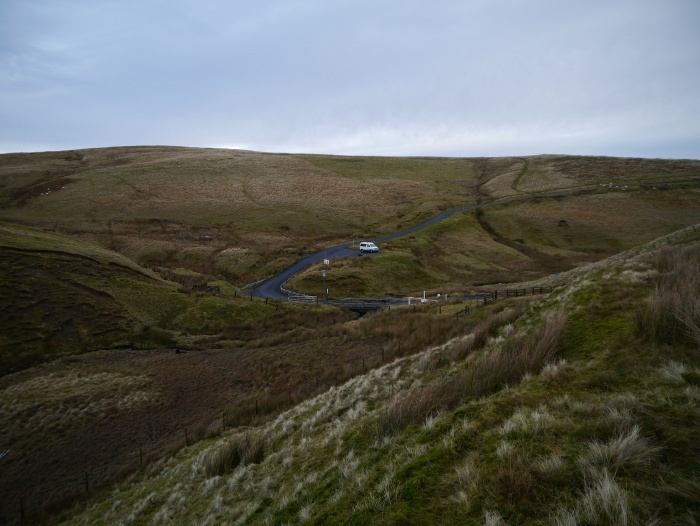 It’s a cracking drive over the moors to near Byrness, the steep sections something you would not want to attempt in snow or ice. Driving the empty road after being alone on the moors it felt like human life had been wiped from the face of the earth. 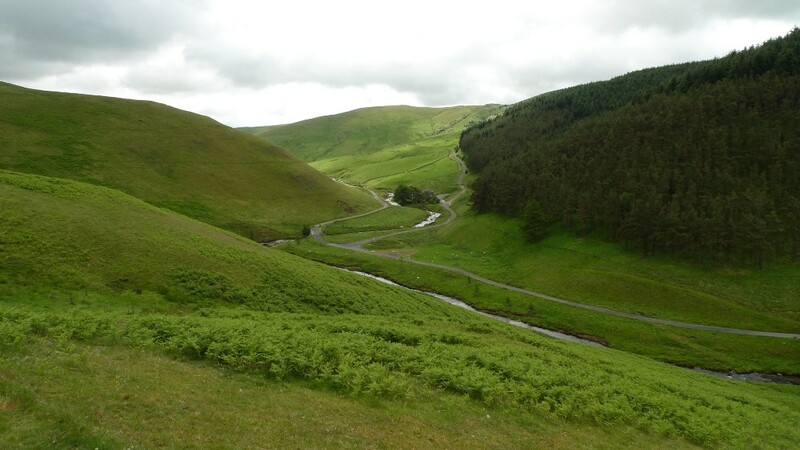 The upper Coquet valley is one of my favourites in England. 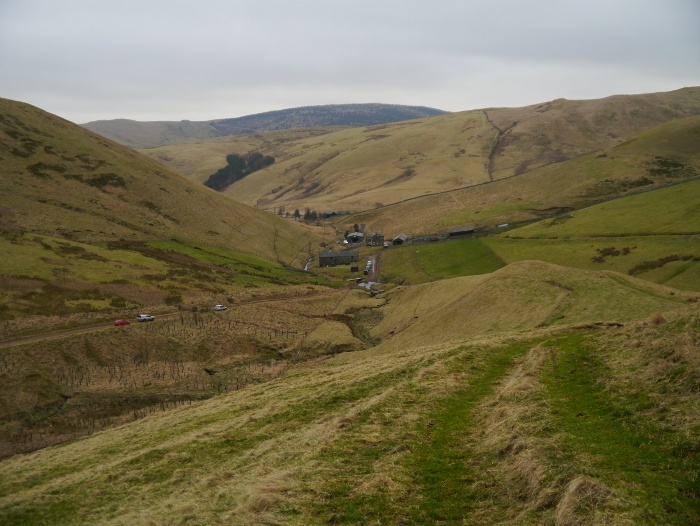 The last village is Alwinton before the single track road twists and turns deeper into remote hill country. This is not a landscape of high mountains and rocky ridges though. The attractions are much more subtle, hidden amongst the hills velvety embrace. 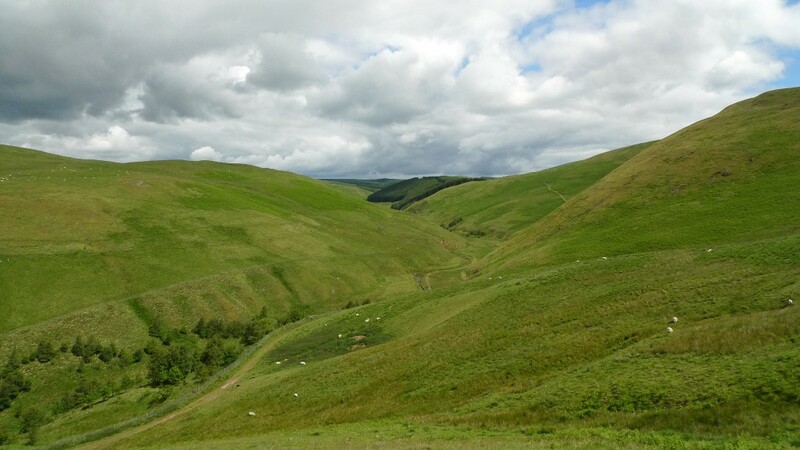 These gently rolling hills allow you to get far away from the maddening crowd. Solitude is easy to find if you want it. Solitude was in abundance as I passed through a deserted Alwinton in the dark and drove up the valley. The road is a complete mess, an assault course of giant pot holes that were invisible in the dark. I was surprised that I had all four wheels remaining when I parked up at Buckham’s bridge for the night. 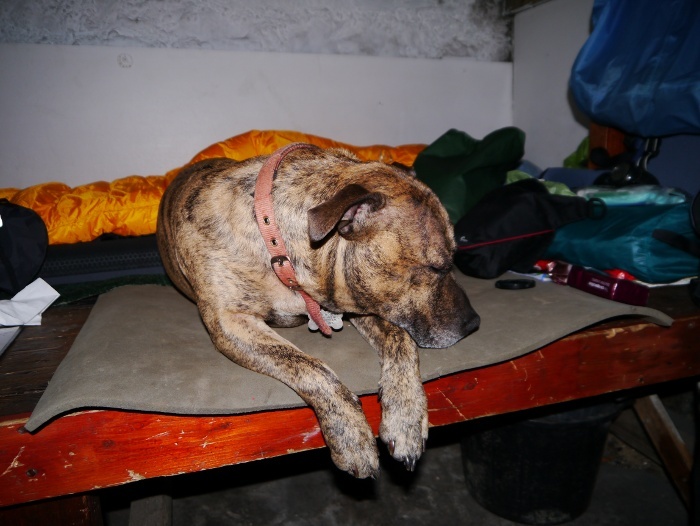 I spent the night undisturbed by any passing traffic and I forced myself out of my rather warm and cosy bed. 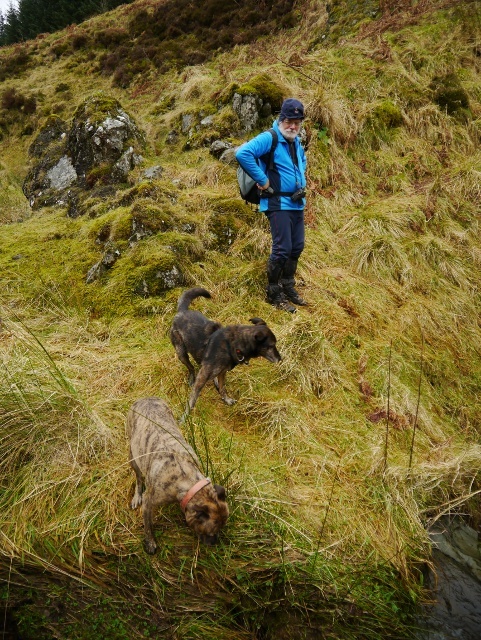 I drove a few miles back down the valley to the car park at Wedder leap, where I had arranged to meet Mike Knipe and his dog Bruno (aka The Northern Pie man). I was early so set about demolishing most of a box of Frosties and numerous cups of coffee for a healthy nutritional breakfast. Mike duly turned up and after introductions we set off up the road. We were passed by numerous 4×4’s complete with quad bikes on trailers. Lots and lots and lots of them. 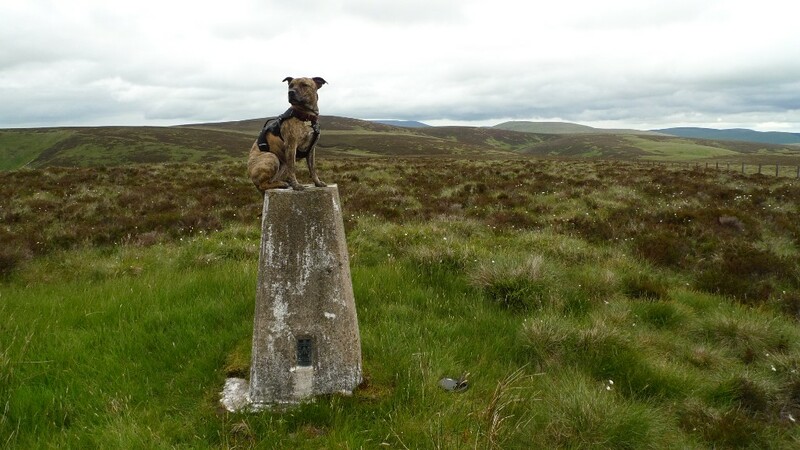 The odd thing is that the owners did not fit the usual moorland churning demographic. They were what I would call a bit tweedy. We would find out their purpose later that afternoon. 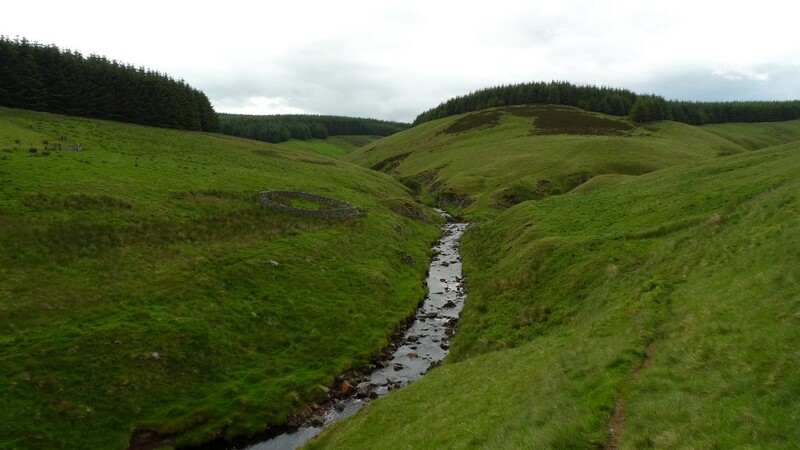 Once across the river Coquet we took to a fine track that climbs above the Hepden burn, giving good if rather murky views down the valley. 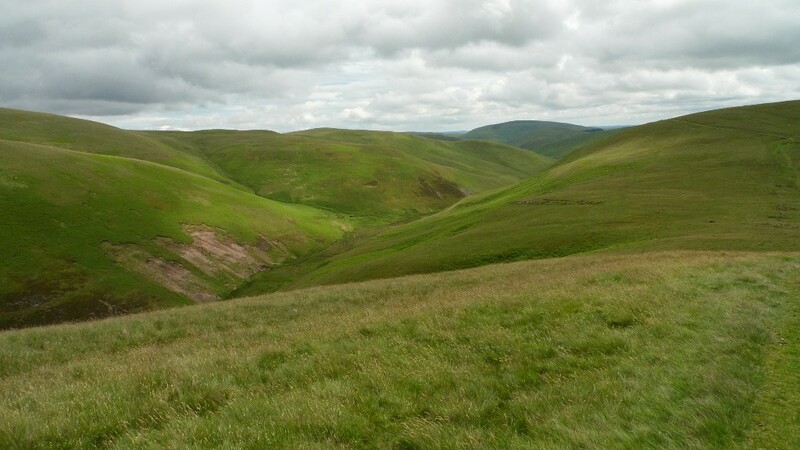 If you like remote valley walking then this bit of the Cheviots is the place to head. 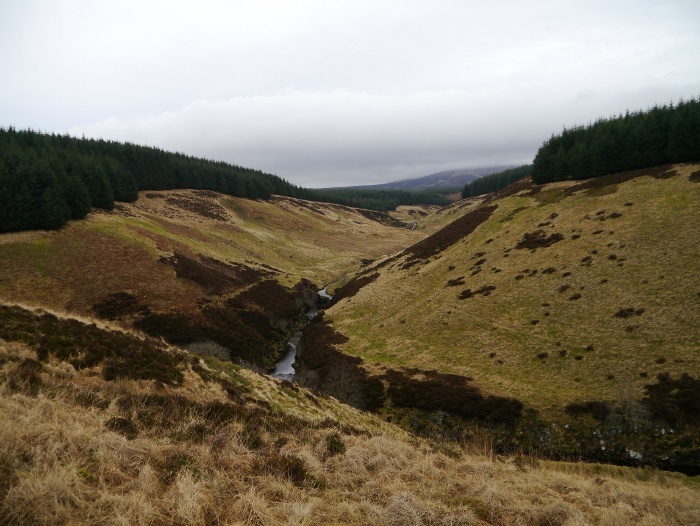 We crossed the watershed and dived into a forestry plantation before picking up a track above the Usway burn. Hidden right in its furthest depths is the exceptionally isolated farm of Uswayford. Mike and myself soon formulated plans to turn a neighboring wooden cabin into top-notch hostel accommodation so that you all can come and visit. It really did have a location to die for if you like it remote. The wind turbine above the farm looked like it was ready to take off in the strong wind. It was spinning at the speed of a helicopter rotor. For me this is the perfect use of green technology. The power was being used at source for a property that is a long way off grid. At only a few metres tall it blended in well with the landscape. Small scale local energy production is much more preferable than plastering the hillsides with 500ft turbines and then transporting the electricity hundreds of miles by giant pylons. 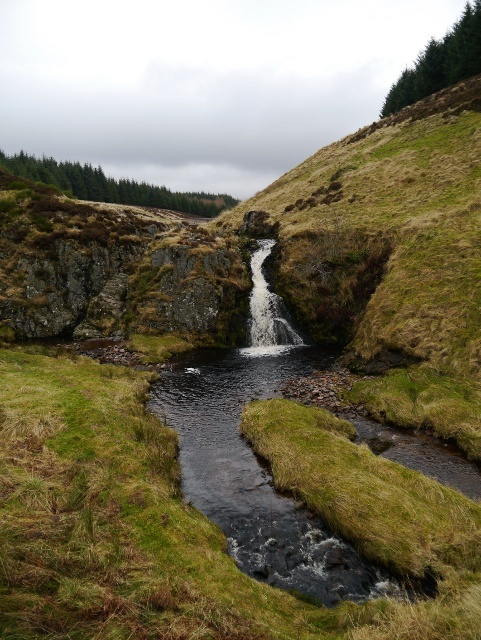 With Mike telling me tales of ‘orrible murders we continued further up the Usway burn, the water carving a rocky course though the grassy hills. With no sheep in sight the dogs were let off lead where they raced around after each other, a bit of barking and counter barking going on. 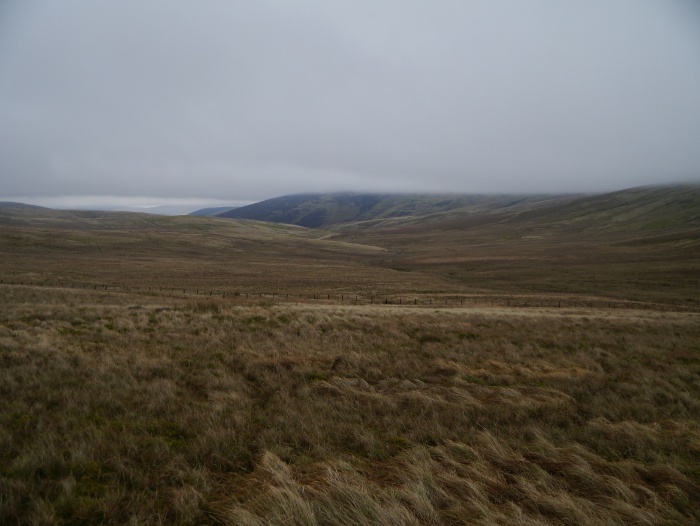 The humans meanwhile struggled on through the increasingly large tussocks. 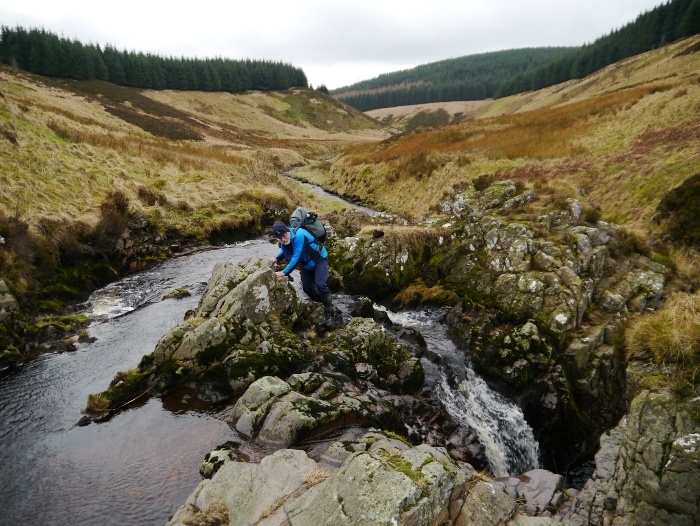 We finally arrived at Davidson’s Linn, a rather remote and slightly underwhelming waterfall. It is actually a very attractive spot but would get laughed at if it turned up at a party hosted by the Teesdale waterfalls. It’s made even more attractive by its out of the way location. There was a few minutes of rocky excitement as we scrambled to the top of the falls. There are actually two waterfalls, the smaller one hidden from view by a little rocky arête. The rocks were wet and a slip would have involved wet feet and possibly wet underpants. I waited at the top with a camera to see if such a moment could be captured. There are some cracking camping pitches at the top which we passed on the way to a sheepfold that provided shelter for lunch. Reuben decided to latch on to Mike as he has learnt that I don’t share my lunch. He had to make do with the crumbs from Mike’s beard as he licked his face. The climb onto the border ridge after lunch was at an easy gradient and we were met by lowering cloud. 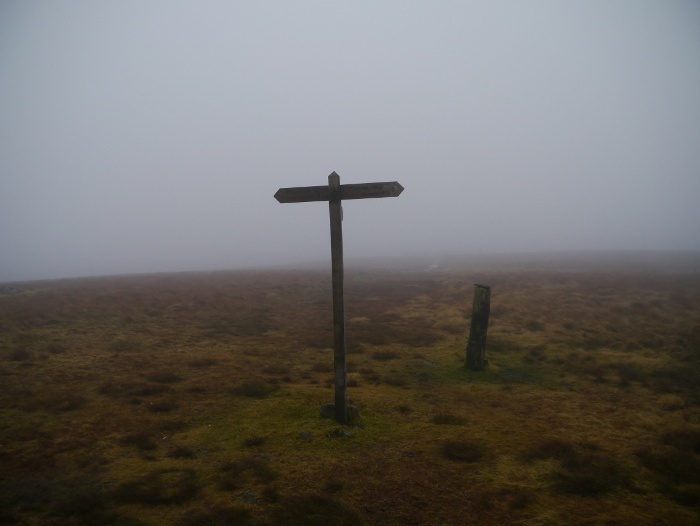 By the time that we had trudged up the slippery flag stones to the summit of Windy Gyle the clag had firmly set in and we saw pretty much nothing. We did briefly sneak into Scotland though. 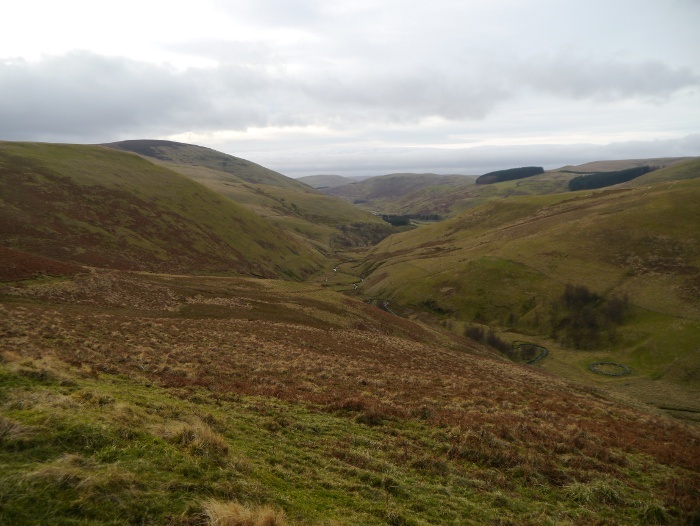 It was pointless staying up high so the bridleway towards Trows was taken where visibility was once again restored. It was whilst descending towards the farm that we found out what all the quad bikes were for. There appeared to be a hunt in progress. 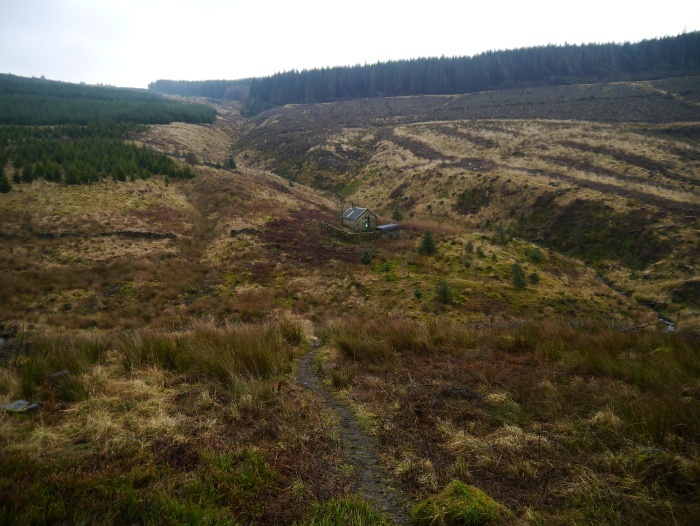 This involved lots of hounds running across a distant hillside with men in camo sat watching through binoculars whilst sitting astride their machines. Even the riders on horses appeared to be doing not very much. Everywhere we looked we noticed groups standing motionless watching, it really did not look very exciting. 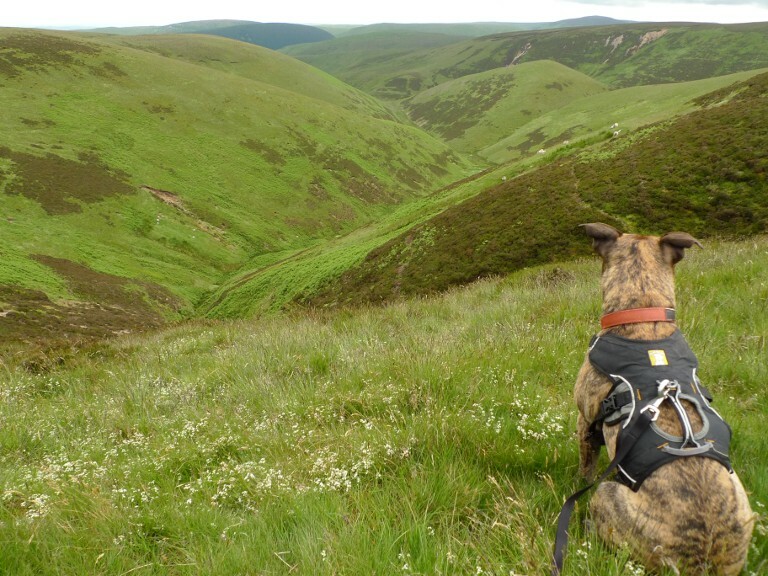 I wonder how strictly the hunting with dogs ban is enforced in such remote areas? The most worrying thing was just how red everyone’s faces were, either alcohol was being enjoyed or many of the participants are heading for an early grave with high blood pressure. An enjoyable day in the hill with good company. Mike is the only other human being I have ever met who knows what a Dewey is. I cannot think of a better way to enjoy an afternoon than discuss various hill lists. My inner geek was unleashed as we discussed obscure hills. Reuben and Bruno appeared to rub along well, neither taking chunks out of the other. Mikes version of the same trip is here. 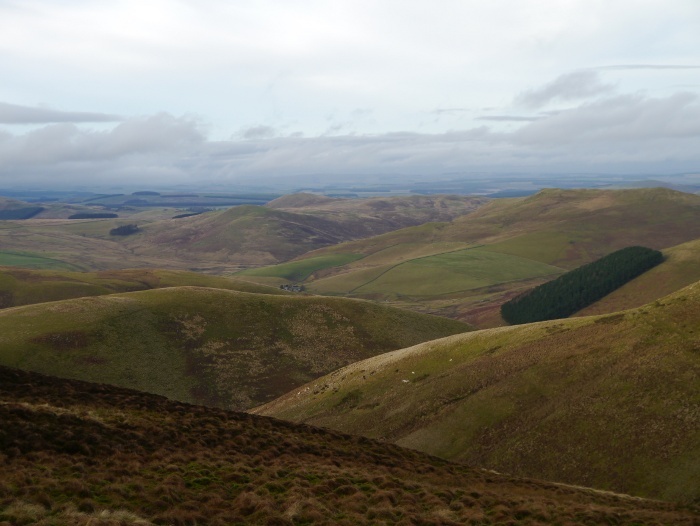 I really feel like the cobwebs have been brushed away after spending four days in the Cheviot hills. The Bongo was my base for three nights, parked up each time in a remote out of the way spot. Then last night I headed to a bothy to sit in front of a roaring fire whilst listening to the wind blow through the eaves. 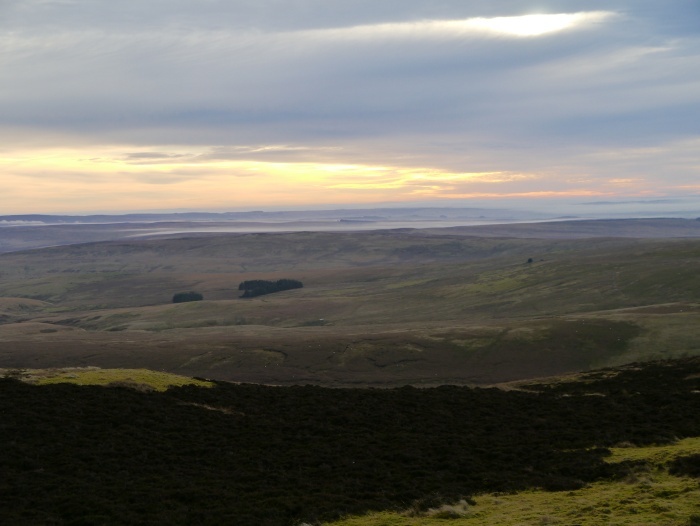 The Cheviot hills are a wonderful place to get away from it all, especially in January. They were pretty much deserted, just the whisper of the grasses under a huge sky. I’ll do a write-up in the next few days. 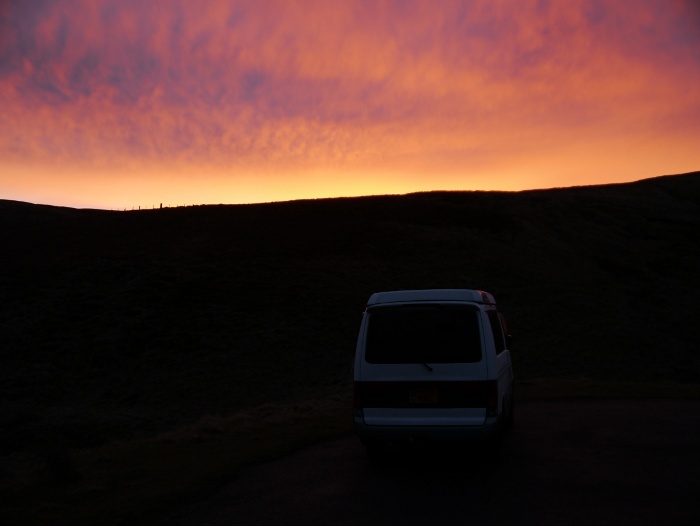 The previous evening and night was a perfect van ‘wild camping’ experience. I parked up at around 7pm and no vehicle passed until 9am the following morning. Time was spent generally lounging, eating and reading the latest TGO magazine that I had bought along. Reuben was much more settled that night, probably due to the absence of the MOD blowing things up in the surrounding hills. It was a good morning for a fester. 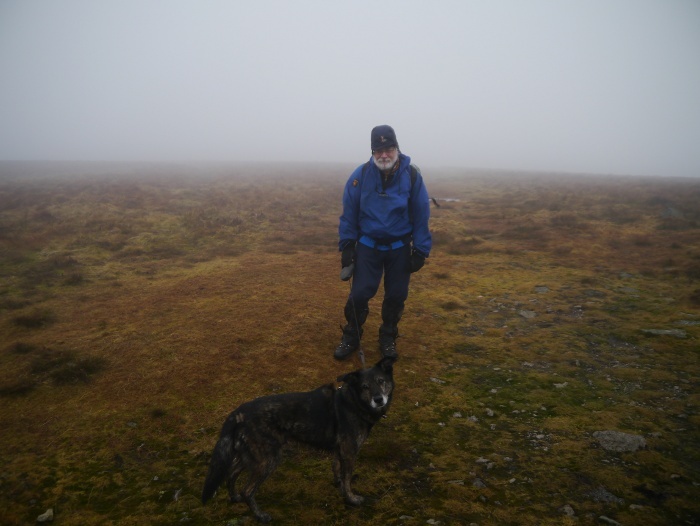 The day dawned grey and drizzly with low cloud shrouding the hills. A mate was coming to join me for the day at 10am so I sat around in the van, content to do not very much at all. 10am came and went and the car park remained empty. By 12pm I decided that I could not sit there all day so packed my rucksack and headed off down the narrow road towards Carlcroft, hoping to bump into them on the way. 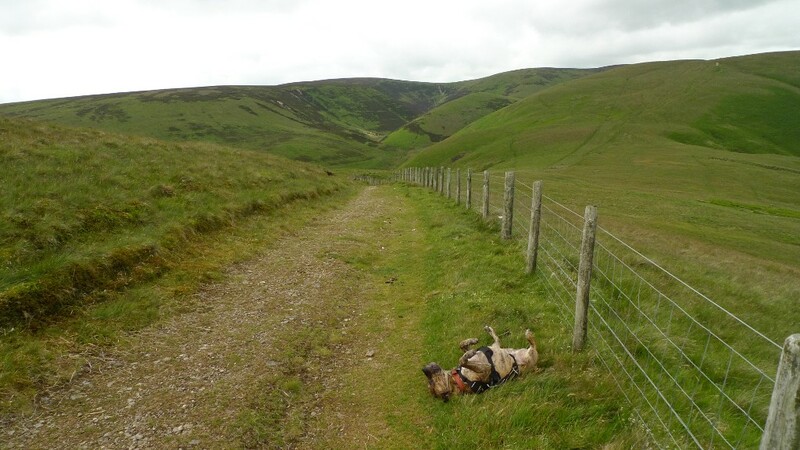 No familiar cars passed so I located the bridleway and headed into the hills. 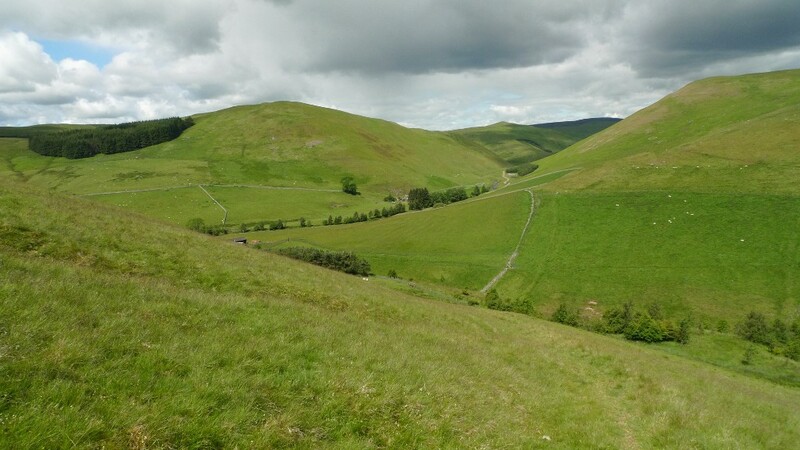 The path contoured at an easy angle, the ground soon dropping away, the surrounding hills every shade of green. As a gate was approached I noticed that a sheep had somehow managed to get its head stuck in it. For some reason it had put its head through the metal bars (grass greener on the other side?) but forgotten that it had horns. The sheep spotted Reuben and Reuben spotted the sheep and there was a bit of excitement on their behalf. I ended up tying Reuben to a fence a good distance away where he stood a whined whilst I set about untangling the sheep. I was baffled how it even got its head in there in the first place. Ten minutes were spent doing a ‘live sheep puzzle’ before I finally cracked it and the poor beast was released. The track named ‘The Street’ was soon reached and I sat to catch my breath. As with the day before I was surrounded by green rolling hills in all directions. My phone suddenly sprung to life, full of messages from the evening before by my mate apologising for not being able to make it today. One of the problems being in a remote area is that communication with the outside world can be difficult. Usually this is bliss, in this instance it was annoying. Walking along the track towards the Border ridge I spotted a large herd of cows in the distance, milling around my intended route. I have heard (get the pun there?) that they can be a dangerous mix with dogs, especially if they have calves. I climbed and then hoisted Reuben over a fence and passed them with the security of a wire barrier. They approached with murderous intent in their eyes, all of them fixated on Reuben who was blissfully unaware. I have never seen cows act in that way before, the usual docile beasts really looked like they wanted to do him some damage. We walked and they followed for some distance. I think if the fence had not been there he would have been flattened. I don’t think that I would ever risk crossing a field of cows with him in tow. 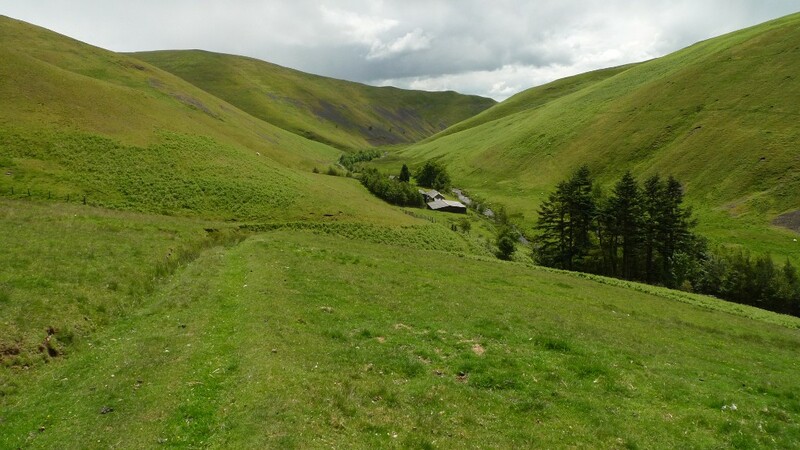 To my left was the long and winding valley of Rowhope Burn, its secret depths no doubt harbouring many idyllic wild camping spots. Approaching the Scottish border the grass gradually gives way to heather, the head of Easthope Burn giving great views into its hidden folds. 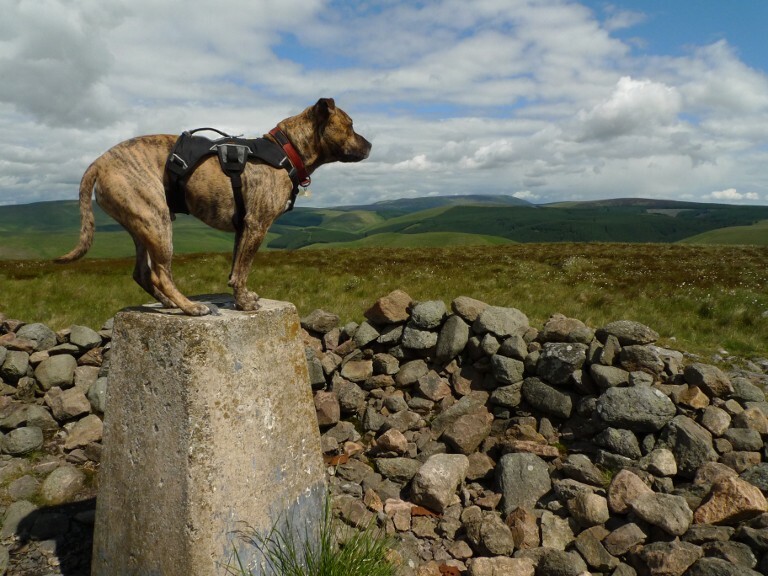 The border fence itself is shared by the Pennine Way on its final stretch, the Cheviot dominating the horizon. This is probably one of the remotest stretches of that long distance route, the only person passed was on her final day. Easy and admittedly unexciting walking brought me to the trig on Lamb hill, where once again reuben demonstrated his new-found trig posing technique. Actually to get one of these shots he has to be lifted up and he then immediately jumps off. It takes a bit of perseverance and you have to be quick! 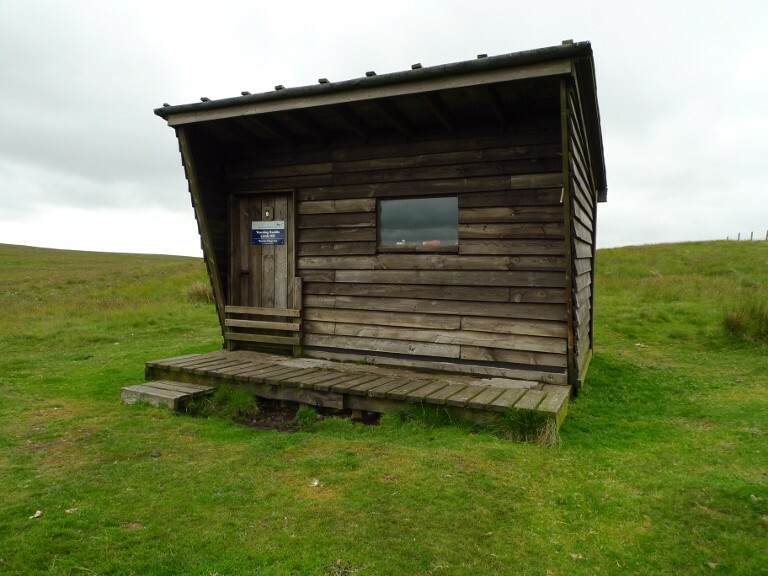 Just below lamb hill is one of the two refuge huts on this long stretch of the Pennine Way. It is a welcoming little shelter, one that I imagine many people have been thankful for. It is well cared for and litter free, voluntary wardens doing a good job. I sat outside for half an hour, shoes and socks off, cooling down in the muggy air. 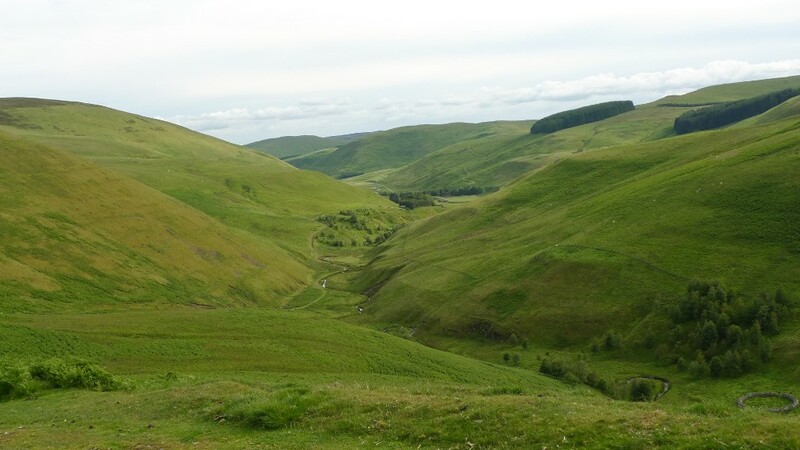 I think that one of the most appealing aspects of the Cheviots are the long and winding valleys that cut deeply into the hills. 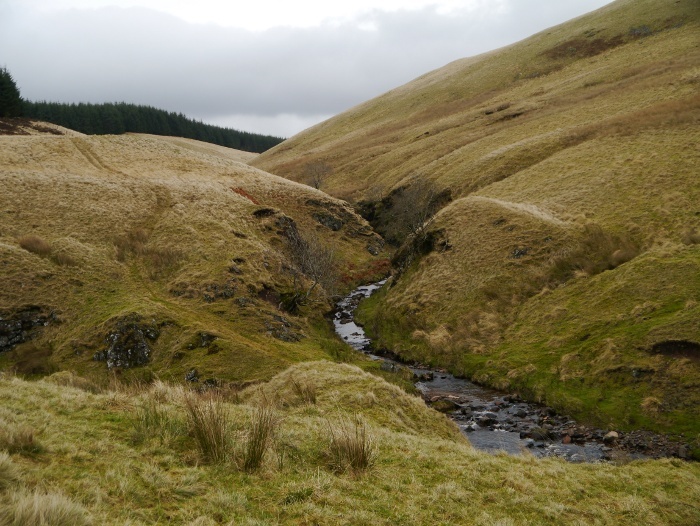 The descent into Rennies Burn, which soon leads to Buckham’s Walls Burn was the best part of the day. 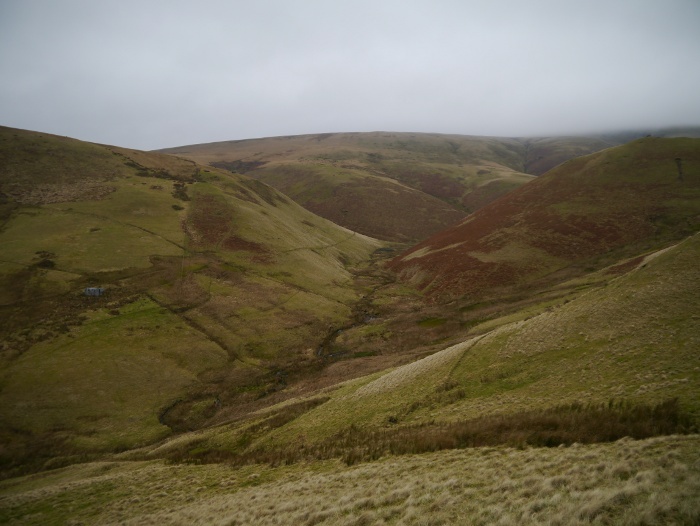 You get the feeling that not many people walk these little valleys. A thought that sprung into my head whilst walking across what looked like firm short-cropped grass. 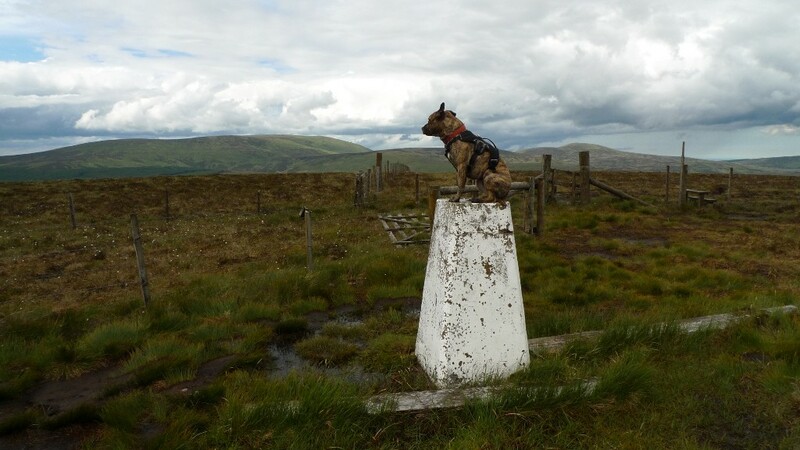 It turned out to be a thin crust on top of a rather soggy bog, one leg being covered in stinking mud above the knee. Reuben then made an easy river crossing much more hard work than it should have been. He has an aversion to getting his feet wet! We were soon back at the Bongo for another evening of solitude, the mist once again settling on the hills as dusk approached.